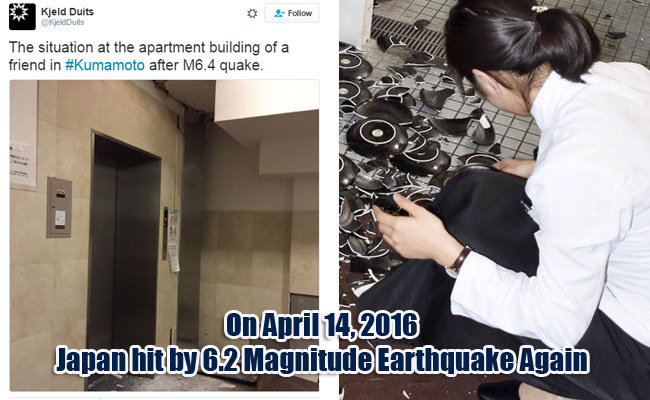 KUMAMOTO EARTHQUAKE- On April 14, 2016 (Thursday), Japan had experienced a new devastating calamity as a magnitude 6.2 earthquake hit the country which lasted for 30 minutes or so. As per to Japan's Meteorological Agency, the earthquake's epicenter was seven miles from Mashiki town proper in Kumamoto prefecture and struck at 9:26 in the evening. A number of aftershocks were also experienced right after the first tremor. Fortunately, the tsunami alert initially issued by Japanese Meteorological Agency was cancelled and there are no existing tsunami alerts as of this time. According to Japanese Red Cross Kumamoto Hospital around 45 people were injured and currently being treated, 5 of them are in critical condition. But this number is expected to elevate any time soon as authorities feared that several people might be trapped under debris and collapsed buildings. Though there is one assumed female casualty, no further fatality was reported. Some areas in Mashiki and Kyushu lost power which affected an estimated 16,000 households. All operations on the Kyushu Shinkansen Line were also suspended because of the power interruption but the Sanyo Shinkansen Line which connects Honshu mainland and Kyushu resumed its operations at 9:40 P.M. even though power was lost between Hakata station and Kokura station. Citizens nearby Kyushu Electric Power Co. need not to worry as its management guaranteed no abnormalities in Sendai Nuclear Plant in Kagoshima Prefecture, according to Japan Times. Shikoku Electric Power Co. assured the same with their Ikata Nuclear Plant in Kagoshima. Both nuclear plants' operators are still making sure of no possible damages in their plants. Prime Minister Shinzo Abe had promptly set up headquarters and assigned authorities to manage assistance for those who need to be rescued and assisted. Chief Cabinet Secretary Yoshihide Suga said that the government was doing exerting efforts to picture out the entirety of the damage so they can act accordingly, along with rescue operations as the top priority. This recent calamity is Japan’s first intensity 7 earthquake since March 2011 in Tohoku region that destroyed a lot of properties and took several lives. A number of photos of damaged infrastructures are also posted online.